Pre heat the oven to 360°F. Heat olive oil in large frying pan on medium to high heat. Add onion, thyme, garlic, mushrooms and sauté for 2 to 3 minutes, without colouring the garlic. Add mince crushing any lumps with a spoon, cook until ground beef is browned. Add the bay leaves, cloves, red wine and reduce heat to a simmer. Reduce wine by half, then add tomatoes, chickpeas and stir through. Cook for 30 minutes, season with salt and pepper. Lastly add parsley to sauce. In a saucepan; place soy milk, onion, cloves, bay leaf and peppercorns and place on a low to medium heat, making sure milk slowly comes to the boil infusing all the flavours. Once milk has boiled, turn off heat and strain into a bowl. Put strained milk back into the pot on low heat. Combine cornflour and water together to make a smooth paste and add to the milk. Stir until the sauce thickens approx 2-3 minutes. In a baking dish, pour ½ cup of beef & mushroom sauce over the base. Cover with a layer of lasagna sheets. Cover the sheets with enough meat sauce to cover pasta. Next pour ¼ cup of white sauce over the meat sauce. 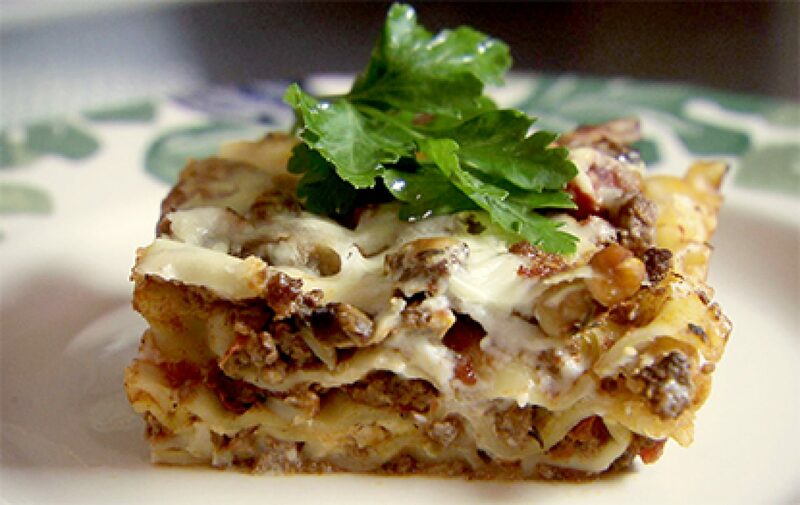 Repeat with pasta, beef and white sauce until 4 layers of lasagna are made. Finish with white sauce on top.